1University of Arizona, Physics Department, Tucson, Arizona 85721 when this work was done and is now with U.S. Naval Research Laboratory, Washington, DC 20375-5000. 2When this work was done Sang Yeol Kim was with Pennsylvania State University, Materials Research Laboratory, University Park, Pennsylvania 16802 and is now with Aju University, Physics Department, Suwon, Korea. 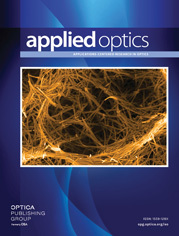 3The other authors are with University of Arizona, Optical Sciences Center, Tucson, Arizona 85721. Optical, electrical, and microstructural effects of Ar-ion bombardment and Ar incorporation on thermally evaporated Ag and Al thin films are investigated. The results show that as the momentum supplied to the growing films by the bombarding ions per arriving metal atom increases, the refractive index at 632.8 nm increases and the extinction coefficient decreases, lattice spacing expands, grain size decreases, electrical resistivity increases, and trapped Ar increases slightly. In Ag films, stress reverses from tensile to compressive and in Al films compressive stress increases. In the Al films the change in optical constants can be explained by the variation in void volume. The reversal of stress from tensile to compressive in Ag films requires a threshold level of momentum. The increase in electrical resistivity is related to the decrease in grain size and increase in trapped Ar in both types of film. Many of these properties correlate well with the momentum transferred, suggesting that the momentum is an important physical parameter in describing the influence of ion beam on growing thin films and determining the characteristics of thin metal films prepared by ion assisted deposition.